When my children were small, I often read the Chronicles of Narnia to them before they went to bed. It was a lot of fun for all of us and I can see the influence of those times even now. The Voyage of the Dawn Treader http://www.youtube.com/watch?v=LuGUVkO0cRM was recently made into a movie and Mary Jo and I received a pass to a screening of the movie shortly before it was released. 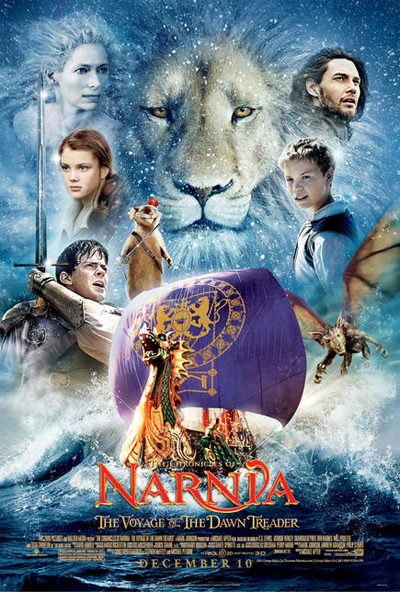 We had seen the previous Narnian movies: The Lion, Witch, and Wardrobe and Prince Caspian and enjoyed them so much that we procured the dvds of each. Dawn Treader will be no exception--rather it has become both Mary Jo's (my wife) and my favorite of the series to date. I am convinced that transformation (old name: sanctification) is the forgotten doctrine in the N. American Church. Many Christians are slaves to addictions and other baggage that wreaks their marriage and families and stunts their fruitfulness for the Lord Jesus. For the most part, they find no help in the Church. The Voyage of the Dawn Treader is all about transformation. Eustace is transformed from a selfish prig to a courageous, even noble hero. Lucy is confronted by, confronts, and finally overcomes her insecurity and resulting temptations. There are more stories of transformation, but I fear I may have already given too much away and keep some from going to the theater to see the movie in 3D. On a personal note, let me say that as I have submitted to the Great Physician's healing grace in my life on many occasions, he has consistently increased the scope of my ministry. My work of strengthening and starting churches has gone from Tokyo, to Okinawa Prefecture, to California, Indiana, and Georgia and soon the Middle East and Asia. I am a God cooperator (Experiencing God 2008) and as I have been faithful in a little the Lord has seen fit to expand my opportunities. My father was an alcoholic and so was my step-father. I grew up with a lot of baggage. But God has poured out grace upon grace as I have sought him and submitted to his potter's work in me. "Those who cling to worthless idols forfeit the grace that could be theirs" (Jonah 2:8). Do you have something you would like the Lord's help for? Would you like to talk more with me about how to access God's grace for inner healing?